Gone are the days when we just sit at a desk in an office with a landline and a computer. We need powerful tools to keep pace with our fast-paced world, but we’re starting to be overwhelmed with too many workplace apps that don’t even talk to each other. 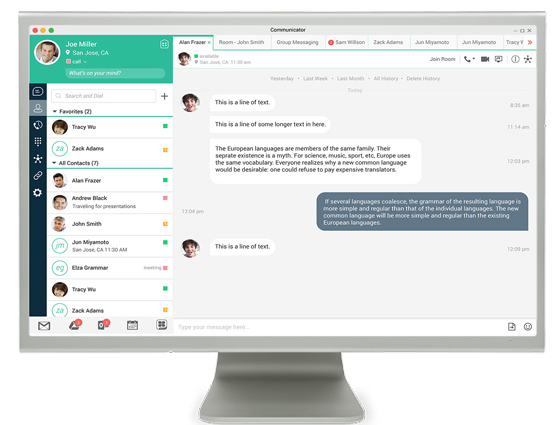 UC-One Communicator lets you quickly find colleagues, start a voice or video call, share files and screens, and even seamlessly move your call with you to another device. One business number extends professionally across all devices/smart phones and tablets for unified communications. UC-One provides a range of different mobile applications that work seamlessly across your devices, each optimized to provide the specific experience that meets your needs. All the apps use the same identifier – your business number – keeping you in sync no matter which app you use and what device you are using. Copyright Spokeip. All rights reserved. Site designed by One Ton Creative.